Cable length is limited to 4.5 meters (14.8 ft), although up to 16 cables can be daisy chained using active repeaters, external hubs, or internal hubs often present in FireWire equipment. The S400 standard limits any configuration's maximum cable length to 72 meters. 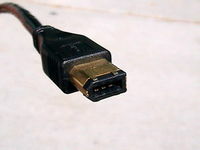 The 6-pin connector is commonly found on desktop computers, and can supply the connected device with power. See the pictured below. The picture on the left is the 6-pin male plug. The picture on the right is the 6-pin female connector. The 6-pin powered connector adds power output to support external devices. Typically a device can pull about 7 to 8 watts from the port; however, the voltage varies significantly from different devices. Voltage is specified as unregulated and should nominally be about 25 volts (range 24 to 30). 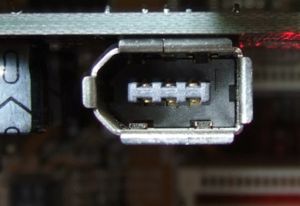 The picture below shows a 6 to 4 pin FireWire cable with the 4-pin connector on the left and the 6-pin connector on the right. 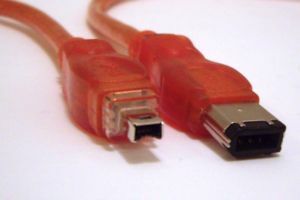 This cable is commonly used to connect FireWire devices such as the FLEX-5000, FLEX-3000 or a FireWire based sound card to a laptop computer. Article has been viewed 7,711 times. Execution: 0.250. 10 queries. Compression Disabled.